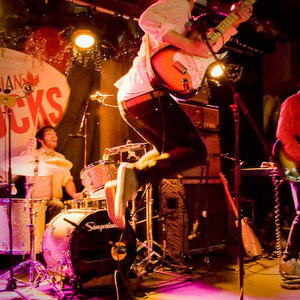 Hollerado is an indie rock band which formed in Manotick, Ontario, Canada in 2007. The band consists of Menno Versteeg (vocals, guitar), Nixon Boyd (guitar), Dean Baxter (bass) and Jake Boyd (drums). They self-released their debut album "Record in a Bag" in 2009 as a free download on their website. The album was re-issued by Arts & Crafts in 2010. Hollerado's members grew up on the same street in a small town in Ontario. Hollerado's members grew up on the same street in a small town in Ontario. There is one bar in the town and on Friday nights the jukebox plays Roy Orbison, and John Prine. One day, while riding the bus, a man in an exquisitely tailored suit said to them ?it is not nearly as fun to reminisce about the times you didn't spend your life savings on four one-way tickets to Japan.? With that in mind they got jobs doing construction. When they were tearing down the old walls they listened to The Who. When they built new walls they talked about time travel. Soon they bought an old van and started a moving company (Haulerado). The van had a tape player and they listened exclusively to the Traveling Wilburys. They are thinking of wearing neon hats for their upcoming February Residency Tour.